Some of you may not have read Dr. Seuss’s short little eco-fable, The Lorax as a kid, and for that you have my sincerest apologies. Those of you who have know that the Lorax is a shortish, oldish, mossy, bossy, typically-Seussian creature who is determined to save the colorful Truffula trees from extinction. In Lorax Garden, all the Truffula trees have been cut down, but with the Lorax’s help, you can make the forests live again! You start off with the last of the Truffula seeds. Lucky for you, you’re all set to make that little guy grow. Plant it in a pot, water it, give it love, and watch it grow. 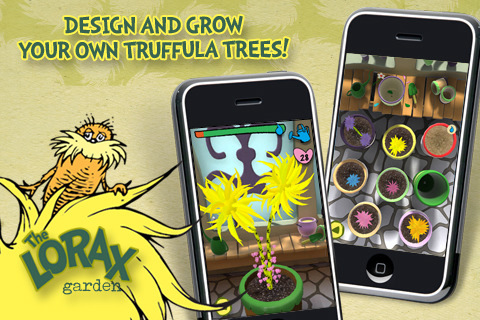 You can also plant flowers to get “care hearts” to help your Truffula saplings grow. As you expand your forests with trees and flowers, you unlock new seeds for new plants. Once a forest is fully replanted, new areas unlock and your nursery space expands. The game itself is very easy, with simple and intuitive controls suitable for small children, but it gets a little tedious for adults. There really isn’t much challenge involved, as it is mostly a gardening simulation, which usually means just making sure the plants don’t get over or under-watered. All the levels are also basically the same, so don’t expect too much variation, but the game looks fantastic. If you were at all worried about how a Dr. Seuss app would turn out, don’t be. Everything starts out in familiar 2-D Dr. Seuss territory, but soon you’re planting and watering Truffula trees in a beautifully rendered 3-D environment. Dead forests start off as dark and barren places with an ominous rock pile carrying the warning of “UNLESS”, but planting trees and flowers cause the place to explode in a zany scene filled with color and character. The sound and voice work in the game is also top notch, although the Lorax’s friendly encouragements do get a bit repetitive after awhile. This is a very cute app, but it’s really basic at best. It won’t hold the attention of an older child or an adult for very long, although you’ll probably get a kick out of it for a little while, like I did. Still, if you are the type who has kids or loves trees, then get Lorax Garden to fulfill all your needs. AppSafari review of Lorax Garden was written by Tracy Yonemoto on May 12th, 2010 and categorized under App Store, Games, Time Management. Page viewed 3580 times, 1 so far today. Need help on using these apps? Please read the Help Page.